Are you about to remodel your Florida kitchen? If yes, you need to know these 11 tips in order to make sure your renovations go as smoothly as possible. Remodeling your kitchen is a big deal that could take well over a month to complete. This time frame will expand like cotton in water if unexpected things have a chance to arise. While you can’t prevent every unknown factor, you can do your part to be prepared for whatever happens, reducing the time it takes to get the kitchen of your dreams while also staying within your budget. These 11 tips are sure to help! Know everything you want before you start any work. The key is to avoid making changes along the way because this will delay the project and potentially cost extra money. It is also a pain to change your mind half way through because you will have to reschedule contractors, purchase new materials and so forth. Don’t rush into it, instead make sure you’re truly prepared and know exactly what you want before any jackhammering begins. Contractors are going to try their best to work around kids and animals simply because that’s the professional thing to do and most homes are fully equipped with pets and kids. Regardless, it’s important to keep your little ones out of the way as much as possible. Not only can they get in the way and delay work, but also it’s not safe or healthy for kids or pets to be in dusty construction zones anyway. Do you have a solid design plan that is well researched and ready to go? Before you start your kitchen remodel the answer to this question should be yes. Otherwise, the entire process will not go nearly as quickly or efficiently. If you have room in your budget you could always hire a designer to help make this process easier. Buying wholesale cabinets and countertops from Tops Kitchen Cabinet may help you make room in your budget for extra luxuries like a designer. It’s more common than you may think for someone to install super expensive cabinetry on a home with a sagging foundation. It’s very rare that a house is better off demolished to the ground than upgraded with a beautiful new kitchen, but it’s still a possibility. An honest contractor will be able to guide you in the right direction if it makes more sense to renovate or start over from scratch. Before taking a hammer to your old kitchen cabinets all building permits for remodeling your kitchen need to be secured in place. Things like plumbing and electrical work will have to be signed off by the city before work moves forward so make sure to have all of this set up and ready to go from the start. If you are waiting on permits after your remodel has already begun you are going to be stuck at a stand still with a ripped apart kitchen. Any unexpected expenses could throw a real hitch in your remodeling plans. Make sure that you are prepared by adding 15-20% extra onto your budget for unexpected expenses. Being ready and fully funded for these sorts of surprises will enable you to handle issues in stride without having to make unexpected sacrifices in other areas. Order materials and appliances before you need them to prevent any delays in the process due to shipping issues, shipment of the wrong products, etc. Make sure you are positive about dimensions before ordering anything. There’s no need to order mass extras, as this is a waste of money. Yet, you also don’t want to order insufficient materials because then you have to order more and hold up the project. Have all appliances and materials set aside ahead of time in a dry and safe location. Your well thought out remodeling plan needs to be pretty set in stone as soon as construction begins. In other words, don’t change your mind if you want things to go as smoothly as possible. 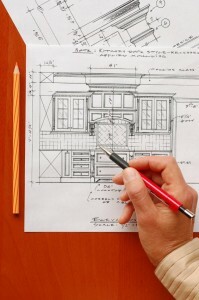 Even minor changes could delay your entire remodel. Larger changes could result in the need to rip up things that have already been done, wasting precious resources and increasing labor costs. Plan and measure everything in your kitchen prior to starting renovations so that you order the correct amount of materials. ¼ of an inch makes a huge difference when you’re talking about cabinet placement. We recommend measuring and then measuring again to make sure you have all of your numbers correct. The fewer big changes you make the more affordable your kitchen remodel will remain. Knocking down walls or changing big things like the location of the sink, dishwasher or fridge will require hiring an electrician or plumber, which is going to add up costs and time. To save even more money, you could reuse certain elements of your old kitchen that are still viable, such as the hardware on cabinets. Or, the tiles on your countertops could potentially be reused as tiles for a fun backsplash. It’s not easy to live without your kitchen but welcome to your new life during a kitchen remodel. Expect to be out of your kitchen completely. A great way to deal with this is to set up a temporary kitchen in a different part of the house. Equip the space with a small mini fridge to store water and quick, easy foods. You could also set up a makeshift prep station to prepare sandwiches and other easy meals in this same space. Tops Kitchen Cabinet is here to help ensure your Florida kitchen remodel goes as smoothly as possible. All thanks to our high quality cabinets, countertops and more, at wholesale prices your budget will love!